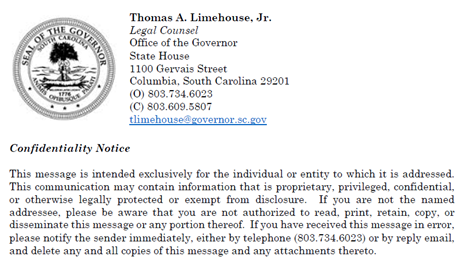 Michael Morisy filed this request with the Office of the Governor - South Carolina of South Carolina. I wanted to follow up on the following Freedom of Information request, copied below, and originally submitted on Jan. 9, 2018. Please let me know when I can expect to receive a response, or if further clarification is needed. Please see the attached correspondence. Please see the attached correspondence. A hard copy is also being sent via U.S. Mail.